Houses as old as ours are full of quirks, especially in the storage department. Downstairs we have a tiny closet in Jack’s room, a very small pantry, and a huge, oddly shaped closet off the guest room. Upstairs there’s an average size closet with a large storage area above and a narrow walk in closet tucked into a corner. That’s it. 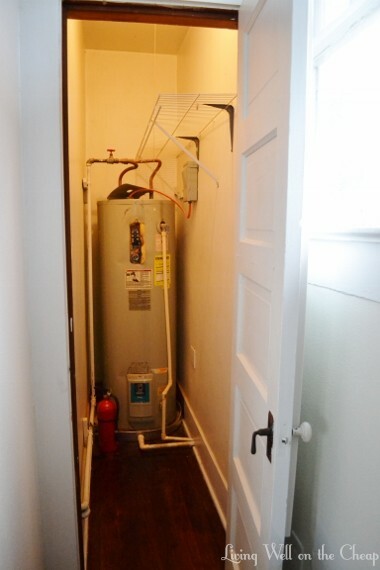 There’s no basement, garage, shed, carport, or accessible attic storage (there is a large attic, just not an opening large enough to fit anything more than a person into. One of my dreams is to change that someday). Finding places to stow normal household stuff like tools, yard equipment, out of season clothing, and Christmas decorations is a challenge. This is the weird narrow walk-in tucked into a corner of our bedroom. We have not made the most of it. It’s been cluttered and underutilized pretty much since we moved in. 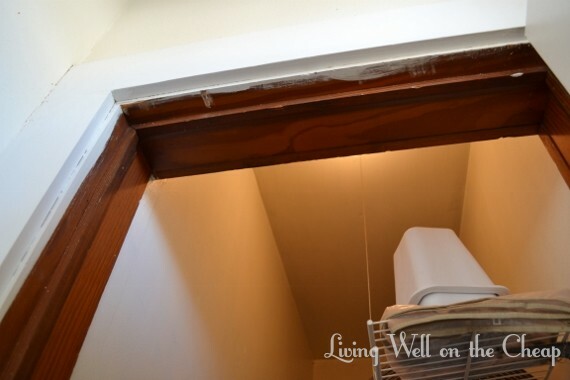 This is the only spot in the house with unpainted trim. Weird to think that at one time all the trim was probably this color! I started out by pulling everything out and, in keeping with my new years resolution to rid our house of clutter, I got rid of everything I don’t use, love, or need. The only roadblock I hit was my wedding dress–I never thought I would be the kind of girl to say something like this, but I just can’t bring myself to part with it. I’m under no illusions that a daughter I might have someday would have any interest in wearing it and it’s completely useless taking up space in a closet. I know I could make somebody very happy by donating or selling it, but I’m not there yet. And probably by the time I am ready it’ll be way out of style and I’ll wish I’d done something with it sooner. It’s probably out of style already and I’m just too blind to see it, haha. All empty. Did you know that you should have a fire extinguisher on every floor of your home? We have one in the kitchen and one up here. After snapping this picture I actually moved it to hide behind a chair next to our bed, since the back of the closet might not exactly be the smartest place to put something needed in an emergency. Almost everything that was in the closest originally got donated to Goodwill or moved elsewhere. The only things that came back were my wedding dress, our most frequently used luggage (a few smaller overnight bags are zipped inside that suitcase), and Jack’s pack n play (now used only for overnight trips since he’s in his crib at night, woohoo!). 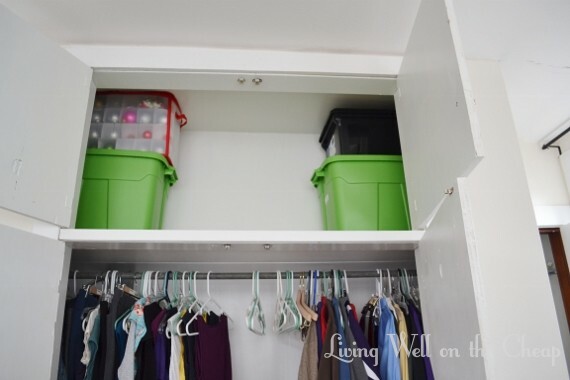 The fabric bins came back as well, decluttered and lining the overhead shelf instead of stacked in that rickety cube tower they were in before. They contain less-oft used clothing items like belts, swimsuits, fancy bras, scarves and hats, etc. As for the other closet in our room, it was also cluttered and underutilized. I forgot to take a before picture, but some sweaters and swimsuits were pretty much the only things in the large overhead compartment. All of our sweaters and jackets got moved to hangers to hang in the main part of the closet for now, since it’s still cool. In a few months when it’s warmed up for good I’ll move them into storage. With the space newly emptied, we realized it was a much more appropriate place to store our Christmas decorations. We’ve always kept them in the large closet downstairs, but since we only get them down once a year that space is better put to use storing something accessed more often. I got the idea from the internet to get comforter storage bags for $1 each at Dollar Tree and use them to store outgrown or out of season clothing. They hold a LOT of clothes! The one on the bottom contains every piece of clothing, blankets, etc., that Jack outgrew in his first six months. It wasn’t even all the way full! If I could have filled it up a little bit more it actually would have stacked better with the bag on top of it, but I ran out of stuff that needed storing. The bag on top contains all of my maternity clothes and a giant maternity pillow. Color me impressed with these dollar storage bags. I plan on filling another with all of our cold weather clothing in a few months. In the photo above you can also see how we have the main part of our closet organized. My clothes are on the left, Nick’s are on the right. Are you impressed with my minimalist wardrobe? I seriously think clothes are the most wasteful thing. Walk into any thrift store (or volunteer with any organization that accepts donations) and you will see that as a society we are overrun with discarded clothing. So I don’t buy many clothes at all, maybe just a shirt or two every few months and a new pair of jeans when my old ones inevitably start to wear thin in the thighs (it’s always the thighs). Below our clothes we have a three-basket system for laundry. Lights on the left, darks on the right, and towels in the middle. Cat optional. 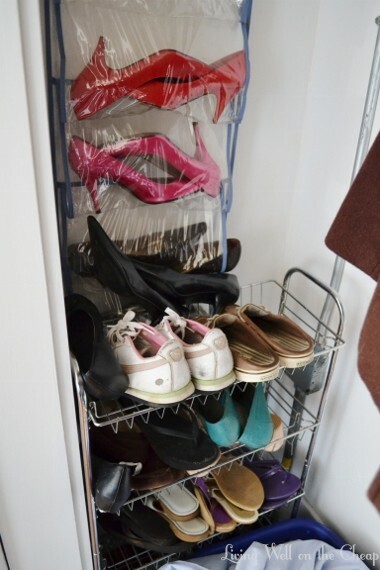 Most of our shoes are usually in a basket downstairs, but officially they live on this metal cart and in the hanging shoe storage thing way over to the side. I probably need to go through my shoes and get rid of the ones I don’t wear next. I definitely do not need this many shoes. Nick has a few shoes over on his side too, but most of his are in the basket downstairs. 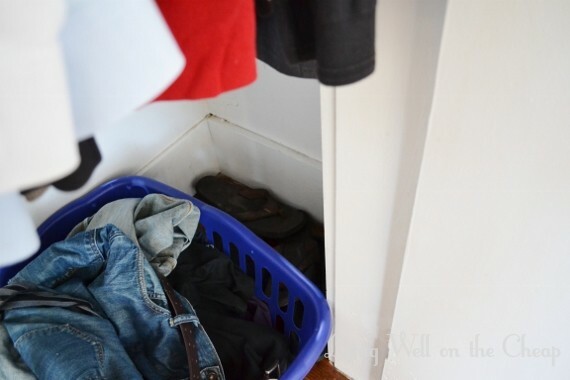 So that’s the story of how we took two spots in our house that were essentially wasted space before and turned them into some seriously functional storage areas, just by getting rid of what we no longer needed and thinking carefully about how best to utilize the space. It’s not the kind of thing that makes a big difference in our everyday lives, but it sure is nice to go to get something from storage and know exactly where it is and be able to get to it easily. I am feeling so proud of my progress so far in decluttering the house! Between this project and the master bathroom the upstairs is improving by leaps and bounds. The only downside is that right now my guest room is full of stuff that I want to either sell or donate–the hardest part of decluttering is that final push to actually get it all out of your house. Those of you who have been around a while may remember that our front room was once full of clutter as well, but it’s now a functional space where Jack and I spend most of our days. It’s a true decluttering success story, haha. Way to go Charlotte! We definitely live in a society of excess, and you definitely notice that living in a house with little storage. Our house was built in the 40s and only has 3 (!!!) closets! It’s like playing Tetris figuring out where to store simple things like the vacuum cleaner. You are so right! 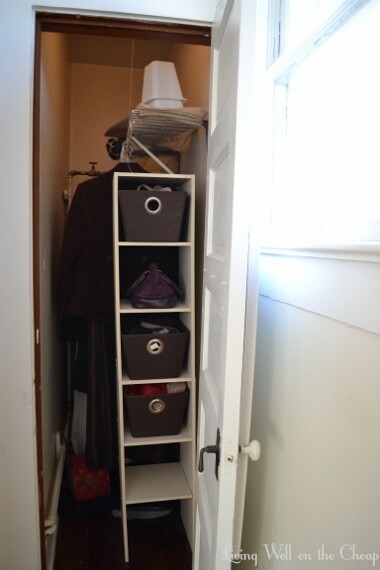 I keep thinking I should make a list of available storage spaces by shape–tall and skinny, low and wide, etc., to help me figure out what should go where. And the vacuum cleaner! I forgot that we have another small closet in our downstairs bath and if I turn it just right and twist it just so the vacuum cleaner just barely fits in below the shelves. I don’t even want to admit how long it took me to figure that one out! I’m impressed with you on everything except one thing… that closet is sad without hundreds of outfits I love clothes! But at least I try to keep it on the cheap side, frequenting TJ Maxx, clearance racks, and the occasional goodwill find. Lol! Well if I had to wear business casual every day I might have a little bit more, but since I wore jeans to my last job and am at home with Jack now it’s really not necessary. Don’t you love the perks of old houses?! We have 1 closet in our entire house, and it is a mess. I think you’ve just inspired me to do some serious cleaning. I LOVE the minimalist approach you’ve got going on! Simplify! P.S. I still can’t part with my wedding dress either. I don’t know if I’ll ever be able to! One closet! I would die.